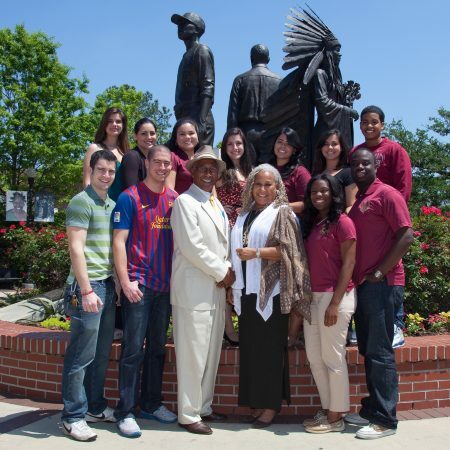 Two pioneers of integration at Florida State — Fred Flowers and his sister, Doby Flowers, center — pose with current students in front of the university's Integration statue. 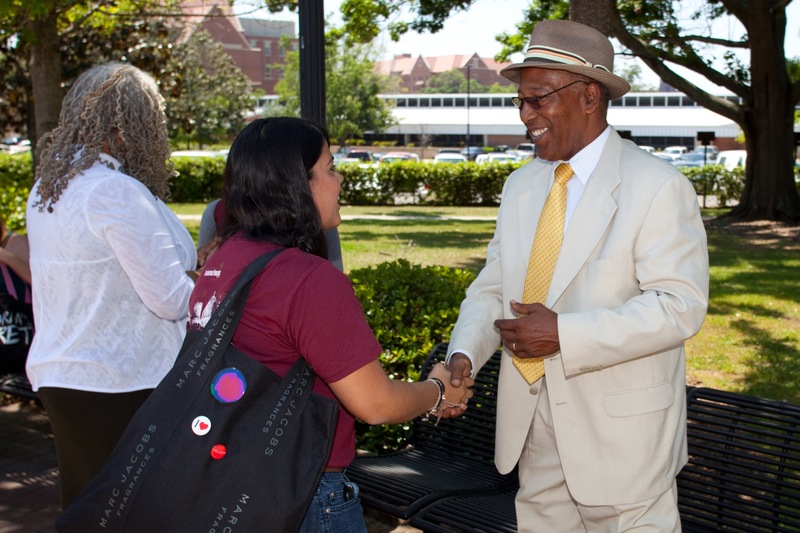 The Florida State University and Tallahassee community will commemorate the institution’s 50th anniversary of integration April 19-21 with several events, including a record-breaking 1,500-person human chain designed to represent the legacy of the pioneering individuals who paved the way for the rich culture, diversity and opportunity that exists at the university today. The commemorative events will honor those who were integral to the integration efforts, including recognition of the first black students to enroll, wear an athletic uniform and be elected homecoming princess. The events include a talk by celebrated poet Maya Angelou. Unlike many other Southern universities, Florida State opened its doors to black students without violence or federal intervention, but its achievement of integration in 1962 was not without challenges for these first students, said President Eric J. Barron. Because of their courageous efforts, tens of thousands of students of all races and ethnicities have made Florida State the great institution it is today. Nearly 73 percent of black students now graduate from Florida State within six years, a rate that exceeds the (Florida) State University System by more than 20 percentage points and the national average by 17 percentage points. Florida State currently ranks third among top public research institutions in the number of bachelor’s degrees awarded to blacks. The Survey of Earned Doctorates also has ranked Florida State among the top 15 institutions for the number of black students earning doctoral degrees. The commemoration includes a website, www.fsu.edu/integration, where people can share their own stories of how integration has affected their lives. The 50th anniversary commemoration will begin on Thursday, April 19, with “Hand in Hand Across Time,” a 1,500-person human chain and a reception at the Integration Statue, located in the heart of campus on Woodward Plaza just south of Oglesby Union. The bronze statue, created by renowned sculptor Sandy Proctor, depicts three of the first black students at Florida State: Maxwell Courtney, who in 1965 was the first black student to graduate; Fred Flowers, the first black student to wear an athletic uniform; and Doby Flowers, who was elected the first black homecoming queen in 1970. The chain will be divided into three branches, each representing the legacy of Courtney, Fred Flowers, and Doby Flowers. Once in place, participants in each branch will pass three commemorative discs from the Integration Statue toward the three ends of campus to signify the importance of passing along the values of diversity and unity. The event will conclude with a reception and several student performances. Fred Flowers will be recognized on Friday, April 20, at the Florida State-Miami baseball game. That same day, students, faculty and staff will attend a graduation reception honoring multicultural students at the Oglesby Union Ballroom. In addition to siblings Fred and Doby Flowers, John A. Payne, a retired associate professor of communication at Florida State, will participate in the weekend’s events. Payne is a cousin of Courtney, who died in 1975. For more information about the 50th anniversary commemoration events, call (850) 644-6626; email Integration50@fsu.edu; or visit www.fsu.edu/integration.